Greetings again from the darkness. Low budget independents must be analyzed differently than a tentpole or a status-pic with money behind it. That’s only fair, and in fact, quite necessary for cinematic sanity. This first feature film from director Michael Chrisoulakis is one that we might catch at a film festival, and at first glance, it appears he has done everything right. The film has a blend of familiar faces and newcomers. Much effort has gone into the stylish look of the film, and there is even unconventional music accompanying the oddball characters. Sometimes taking all the right steps still doesn’t mean the finished product will click with audiences, and that appears to be the case here. Priscilla (Arielle Brachfeld) is being treated by her hypnotherapist played by legendary director Peter Bogdanovich in a terrific opening that grabs our attention immediately. Priscilla is a struggling/aspiring actress who is also a Marilyn Monroe waitress at a crummy little diner. Benny (Azim Rizk) is one of the diners few customers, and his motivation is less about food and more about Priscilla. One day she overhears a couple of small time crooks (led by Lin Shaye) chatting in riddles – “Apple Jacks down the rabbit hole”. Financially strapped Priscilla proceeds to draw lovestruck mechanic Benny into a situation that will likely end badly. Writer Guy J Jackson (who also plays one of the criminals) seems to try and shove all of his ideas into the script, so what’s lacking is a cohesive story or any chance for viewers to connect to Priscilla – or certainly any other character. We can’t even take the “big” crime boss seriously since his goal is to build some type of sanctuary that will benefit humanity. Benny does have the best line in the film when he admits, “I dance like a mechanic”. Other comedic bits mostly fall flat (although a tip of the cap for the mortgage broker joke), as do most of the attempts at building suspense, due in part to an excess of groan-inducing dialogue. The film is a noir-wannabe with some effort given towards the atmosphere and tone, but the overwrought electronic score is too generic, and the arbitrary slow-motion effects simply remind us of the lack of budget (better to take advantage of imagination). 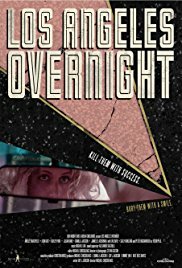 One of the worst cinematic on-foot chase scenes takes up a chunk of the film, but on the bright side, we do get the rarely seen Sally Kirkland, and it is fun to pick out the director’s influences based on how a scene plays out. The jury is still out on Ms. Brachfeld. She might be worth keeping an eye on, as she has a Miranda July quality about her, though without the comedic instincts. First films are challenging, and there might be enough here to push Mr. Chrisoulakis on to better projects.